Wellington is the northern gateway to the Shropshire Hills Area of Outstanding Natural Beauty and the county’s second largest market town. Lying just a mile from The Wrekin (and around half that distance from its smaller sibling The Ercall), this ancient place — thought by some to be a contender for the title of Shropshire’s oldest town — is the perfect launch pad for visiting one of the Midlands most iconic natural landmarks. Once here, you’ll find a warm, hospitable welcome and a wide range of independent shops, cafes and restaurants to make your stay that much more enjoyable. Wellington was granted its first Royal Charter in 1244, when the medieval street grid that comprises its pedestrianised centre was first laid out, and its market (one of the largest in the region) is still the beating heart of the town today. Over the centuries, many famous figures have traversed Wellington’s narrow, characterful streets. It was on the outskirts of the town that King Charles I effectively declared war on his Parliament in 1642, while Dr William Withering, renowned for his pioneering work on the medical properties of digitalis, was born here a century later. Wellington is also celebrated for its extraordinary literary connections. The town was the birthplace of the Victorian novelist and childrens campaigner Hesba Stretton, played a starring role in the foundation of the Bronte dynasty, and was the location where the author Bruce Chatwin (whose evocative, semi-fictional novel On The Black Hill painted such a vivid portrait of life in the Marches) was educated. Philip Larkin, one of the Twentieth Century’s greatest literary figures began his professional career as a librarian in the town, where he wrote his only two novels and published The North Ship, his first collection of poetry. Whisper it quietly but this unassuming old market town could just be one of the Shropshire Hills best-kept secrets! If you’re planning to explore the northerly reaches of the Shropshire Hills, Wellington is an ideal starting or stopping-off point. A mainline railway station is located in the centre of town with direct connections to London, the West Midlands and the Mid-Wales coast. Situated but a stones throw away in the Parade, you’ll find the bus station, which has a wide range of local services to all points of the compass. The town is fortunate to have not one but two long distance National Cycle Network routes passing through it, Route 55 and Route 81. For those wishing to stay a while, secure cycle parking facilities are located at various points around the town centre, while spares and repairs are available at Perry’s cycle shop in Tan Bank. If you’re visiting by car, Wellington is just minutes away from the M54 and can be accessed from Junctions 6 or 7. Free parking is available all around the town centre, offering a convenient alternative to the often-congested environs of The Wrekin — provided you’re happy to walk there that is! A wide variety of local books and leaflets can be found at Wellington Library and Civic Centre, located in Larkin Way, Tan Bank, TF1 1LX. Half way between the town centre and The Wrekin there exists the rare survival of a near-perfectly preserved Victorian gentlemen’s residence and miniature estate. 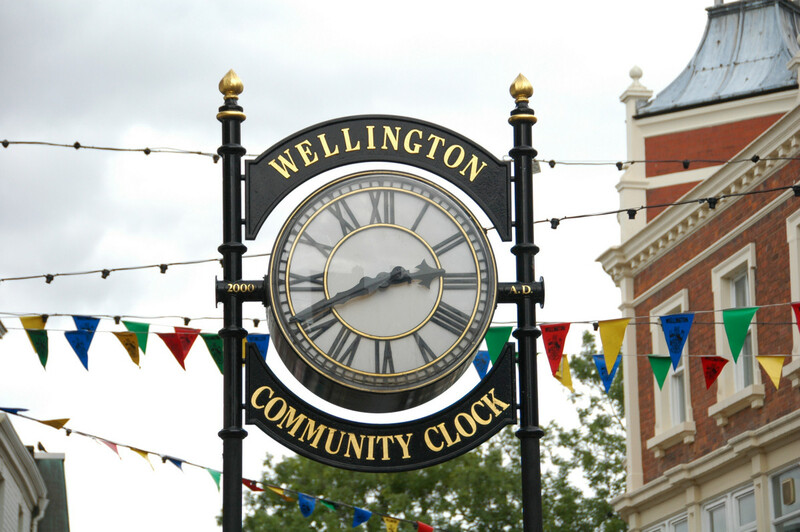 This National Trust property (replete with tea rooms, second hand bookshop and childrens trail) helps to tell the story of affluent suburban life in an era when Wellington grew from an overgrown village to one of the region’s most prominent market towns. Located at 200 Holyhead Road, Wellington, TF1 2DR. Situated a mile or so north of the town, Apley Castle was once the home of the Charlton family (whose influence can be detected in several street names and buildings around the town centre). Until it was bulldozed into its cellars in the mid-1950s, this was perhaps Shropshire’s finest stately home and rumoured to be the inspiration for Blandings, PG Wodehouse’s fictional country pile. Thankfully, much of the inner estate remains intact and, thanks to the efforts of a dedicated group of volunteers, is being brought back to life for Twenty-First Century visitors to enjoy. Charter Day: every first Saturday in March, Wellington celebrates the granting of its first Royal Charter in 1244. An animated mixture of historical re-enactment and street entertainment, this event also celebrates the town’s growing reputation for good food and drink. Midsummer Fayre: All Saint’s parish church provides the setting for this bold re-imagining of one of Wellington’s traditional medieval festivals, which grows bigger and more lively with each passing year. Picking up where Charter Day leaves off, there’s not only a winning mix of street entertainment and pageantry but an impressive array of stalls dedicated to traditional crafts and the work of local community groups. Community Carnival: much like the Midsummer Fayre, Wellington’s annual carnival takes place in mid-June under the watchful gaze of The Ercall in the attractive surroundings of Bowring Park (which, with its refurbished café/kiosk, also makes a great pit stop half way between the town centre and The Wrekin). Literary Festival: for three weeks every October, Wellington hosts one of Shropshire’s premier literary festivals, which in 2016 celebrates its twentieth anniversary. Over the years, this entirely free event has hosted an array of international best-selling authors, academics and local writers. Better still, it’s augmented by a surfeit of specially arranged workshops, reading groups and a highly popular ‘poems and a pint’ evening, all aimed to offer succour to aspiring writers everywhere!